1. If you want to make your own mayonnaise, crack two egg yolks into a bowl (save the egg whites for an omelette later). Gently break the yolks with a small whisk. Add the mustard and mix well. Then slowly add the rapeseed oil, a few drops at a time, whisking constantly. Continue to do this for a good 3-4 minutes until you get a thick, creamy mayonnaise consistency. Slowly whisk in the lemon juice. Season, decant into a clean jar, close the lid and and chill in the fridge. 2. Prepare the samphire by picking out any particularly woody or hard bits, then blanch in boiling water for 30 seconds, drain and chill. 3. Preheat the oven to 180°C, gas mark 4. Place the croissants in foil, put on a baking tray and heat in the oven for 5 minutes. 4. To make the filling for the croissants, put 2-3 heaped tablespoons of the mayonnaise into a bowl and add all the filling ingredients (leaving the smoked paprika and the chives to the end) and toss gently to coat well. You can cover and keep in the fridge should you want it really chilled. 5. 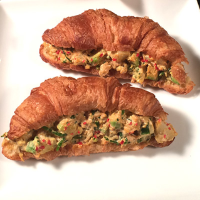 Remove the croissants from the oven, slice them in half down the middle and fill them with the crab mixture. Serve them with a glass of prosecco or champagne for a special brunch. You could also add potato - boil the Jersey Royals in a pan of salted water for 15-20 minutes, drain then chill. Mix in with the crab mixture before filling the croissants. Because it contains uncooked egg, home-made mayonnaise is not suitable for the young, pregnant women, the elderly or those whose immune systems are weak.